Newly renovated! 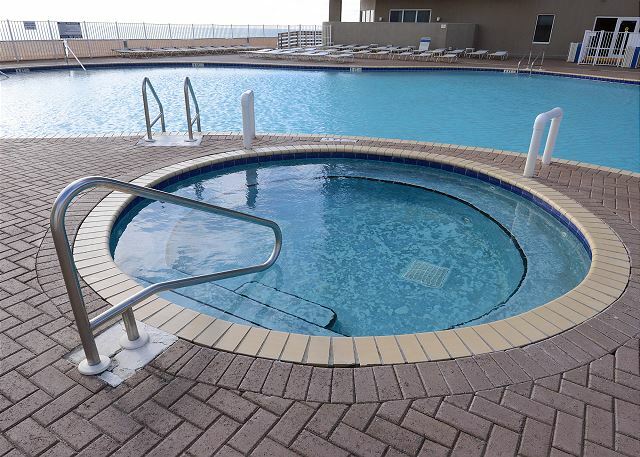 Welcome to ‘The Getaway’ condo at Tidewater Beachfront Resort! Whether you’re here for a break from the kids or with the kids, need quiet time for two or a shopping trip with your most boisterous girlfriends, The Getaway is here to leave your cares away. As you might expect from a place named The Getaway, you’ll delight in a home away from home filled with seashore colors perfect for a tranquil and serene stay. Details The Getaway is a beautiful 1 bedroom with separate bunkroom (not bunks in a hallway alcove), and sleeps up to six (6) with king master bedroom suite, bunk bed and memory foam sofa sleeper in the living room plus 2 bathrooms and gorgeous Armstrong Prysm floors throughout. A washer and dryer are included in the unit. Inside The Getaway, water surrounds you outside the floor-to-ceiling patio doors in the living area. Whether you choose to play chef or mock in laughter as you take a break from cooking duties, you’ll have a fully stocked kitchen with stainless steel appliances and chalk painted cabinets at your service. Enjoy spectacular sunsets from your private balcony and lose track of time altogether! The Getaway is just across the corridor from the elevator, so it almost feels like having your own elevator car. Included Extras! 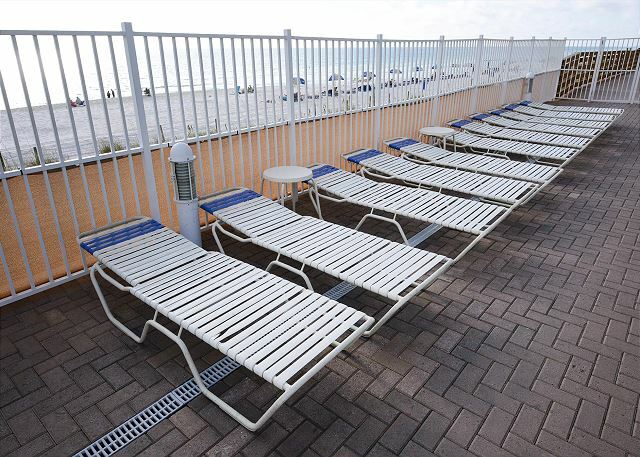 ONE FREE PREPAID BEACH SET-UP IS INCLUDED WITH ALL SEASONAL RENTALS BETWEEN MARCH 1 AND OCTOBER 31. THIS CONSISTS OF A DOUBLE PADDED CHAISE LOUNGE WITH UMBRELLA AND WOULD OTHERWISE COST $35 PER DAY OR $175.00 PER WEEK. SIMPLY CHECK IN AT THE BOOTH ON THE BEACH AND GIVE THEM OUR UNIT NUMBER AND THEY WILL SET YOU UP! 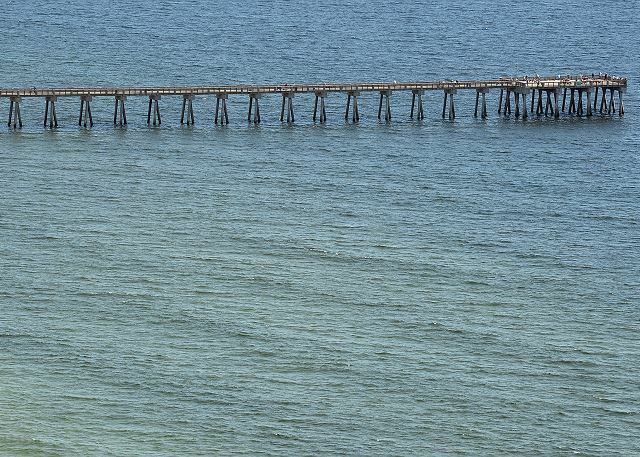 Resort & Location Tidewater Beach Resort is situated on the peaceful west end of Panama City Beach and within walking distance of Pier Park, Dusty's, Hook'd and Margaritaville. 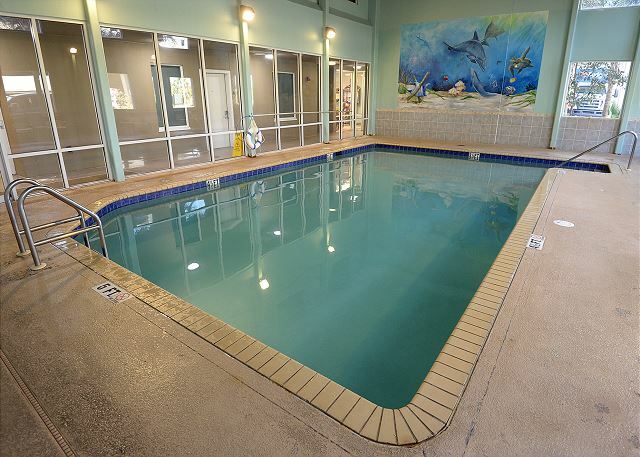 Stay as busy or as relaxed as you want to be, and enjoy the property's fabulous amenities with two large outdoor pools and hot tubs, one heated indoor pool, fitness center, steam room and media center with free movie showings, and on-site restaurant and store. 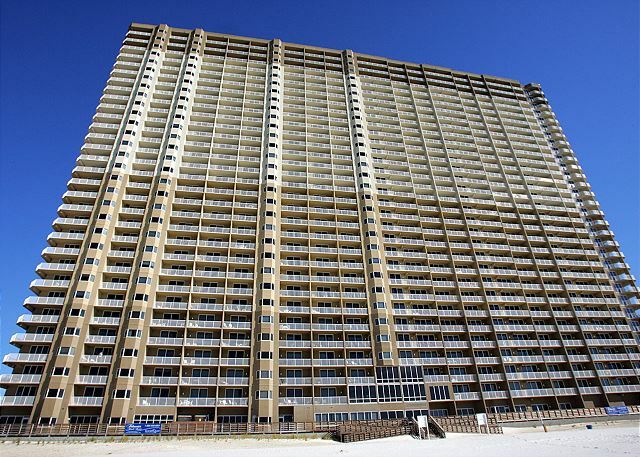 Tidewater is located directly on the award-winning gulf beach where you can walk for miles in either direction. You never have to leave the property if you so desire. 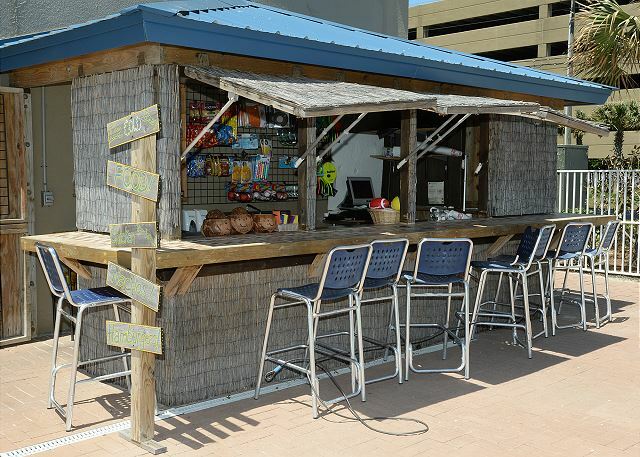 Waves Bar & Grill on the first floor above the lobby serves breakfast, lunch and dinner. Get your morning Starbucks coffee and ice-cold beverages to go at Flip Flops Corner Market on the ground floor at the west end pool deck. 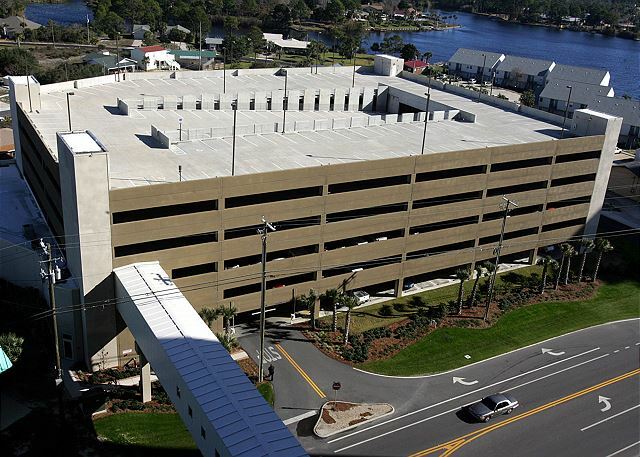 Explore the amazing Pier Park lifestyle center which includes over 1 million square feet of shopping, 20+ restaurants, 16-screen movie theater and outdoor concerts including the Seabreeze Jazz Festival. If you’re in the mood to wander, the idyllic beach towns of Seaside, Water Color, Rosemary Beach, Alys Beach and Carillon Beach are a short drive away, or consider a day trip to historic Apalachicola. Our condominium is professionally managed by Harry and Miriam Forster and their team at Four Star Condo Services They have a reputation for maintaining meticulously clean units. All reservations and rental payments are made through them. 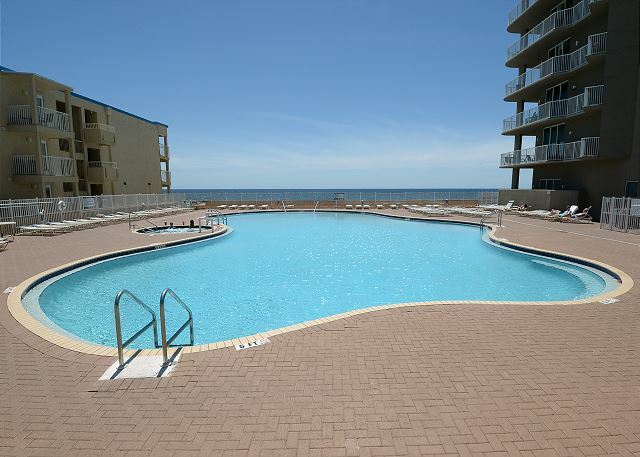 We hope you enjoy our condo and the beautiful beaches as much as we do! good experience. Besides the bunk area being smaller than expected, and some cleanliness issues, everything else was great. Was a great place, clean, conveniently located. The condo was exactly how the pictures showed. It was very pretty. There were a few complaints though that I feel are minor and need to be addressed. The dryer made a HORRIBLE screeching noise anytime you put anything in it, the guest bathroom toilet was loose and every time somebody used it it sounded like it was going to go through the wall, the comforter on the master bed was dirty and has something sticky on it. I feel like that needs to be washed everytime somebody stays there and the pillows were HORRIBLE. I've never stayed somewhere where the elevators were THIS bad. At one time we waited 17 mins for an elevator (12th floor with a 9 year old and a 10 month old) it was ridiculous!!! I understand peak season but this was not the reason. The elevators made our decision to not stay here again though. We arrived and the condo was dirty and the balcony had a sticky substance all over that made it difficult to enjoy. Sent pics, but never received a response. The condo is nice and nicely decorated. The elevators were sometimes a long wait as the reviews, but we thought manageable. Unfortunate for us, we picked "senior trip week" which was many times not kid-friendly on the beach. Overall, we had a good experience in this condo, but wish we would have heard from someone about the cleaning issues...especially since we did pay a cleaning fee. it was very good. we were a little disappointed that the women's steam shower was not operational the whole stay. Renting was super easy and the condo was beautiful with an amazing view. Just fine except for double payment on registration. Came down to enjoy a weekend in November and were surprised to see so much going on in PCB! Hadn't visited in a long time and loved seeing all the things to do so close to the condo, especially Pier Park. Condo was lovely, comfortable and nicely decorated. Smooth rental- we'll be back! Love Tidewater Beach Resort. Our condo was very nice and clean. Four Star Condo Serives provided great service. Overall a wonder vacation. We stayed in this condo the week of the 4th of July and we have no complaints! We loved it!! Overall we had a great time! There are just a few things..The shower curtain in the master bath was mildewed and needs replaced. Also, the shampoo holder is rusted and should be replaced or taken down completely. The bathrooms were a bit dirty, floors, shower walls, etc. not a deal breaker but could use improvement. Not related to the room but the building itself, the elevators are crazy slow...we waited a minimum of 20 minutes every time. The pools were freezing, therefore the hot tubs were over crowed while the pools were practically empty. The spa was closed for maintenance the entire time we were there...when I asked about it, they lady said it was only down for 2 hours and I professionally told her it had been closed since our check in and she said "well, I don't know". The security was nice but some of the guards were a bit obnoxious. My husband & I stayed here celebrating our 6 year anniversary. Very nice & clean unit! Great location near Pier Park. Friendly staff including security guards! Dishes & pots were in good shape which is a plus cause we cooked a few nights. The view was also amazing & parking was convienent. I would definitely stay here again. Most of the staff was friendly and helpful. The room was pretty clean with the exception of the toilets (not gross, but not spotless either). Furniture okay but a little hard & broken down. The TV in the living room only got 1 channel. We tried contacting support but never heard back. Had to watch the olympics sitting on the bed. Went to the theater on Wednesday night but the projection was messed up. The staff replied "I don't know how to fix it " & left. Disappointing! Beach chair rental was great. Would have been nice to know it opened at 8:30AM to get your chairs. One day both pools were being worked on at the same time & the ocean was closed. Bad planning on the part of the Tidewater. The view from the balcony was great & there was a nice table & chairs to use on the balcony. My husband has an issue with mobility & balance so using our shower/tub combo was difficult for him.) The WiFi worked well & there were plenty of restaurants in the area. Being on the west side of PCB was quieter & nice; more low-key. The pools were nice & pretty large. The weather was uncooperative (it rained a lot almost every day & the ocean was off limits 5 of the 7 days were there) but the hot tubs worked & the beach was nice. The runner was very nice beautiful beach view. Sit out on the balcony early in the morning drinking coffee watching the sun come up.